OpenText Hightail is well suited to store large files and have them easily accessed by different members of your organization that have their own login information. It's less appropriate for hosting direct links to share videos or data to constituents that are not direct staff or don't have their own login information. Storage: OpenText Hightail has a large amount of storage and can handle videos. Organization: It's easy to shuffle and organize data to make sense for you. It would be nice to track who is downloading, not just unknown. Files often expire within a few days, it would be nice if they lasted longer. We sometimes have to resend if the client didn't click right away. Hightail has the specific features we were looking for and makes it super easy to send large files over email. Its cost and ease of use makes it our preferred solution for sending large files. It doesn't have all the features of Dropbox, but is also lighter weight and tasks can be accomplished faster. We use Hightail for sending out proposals to prospects. It is a major part of that process for us. Hightail is one of the first touchpoints a client has with the agency. Improve review process with inline commenting for visual files. Lite: Send large files with anyone. Files are limited to 100MB for each file size uploaded, 2GB storage max. Files expire after 7 days. Pro: Send large files with anyone and set advanced security permissions such as expiration dates and access codes. Files are limited to 25GB for each file size uploaded, with unlimited storage. 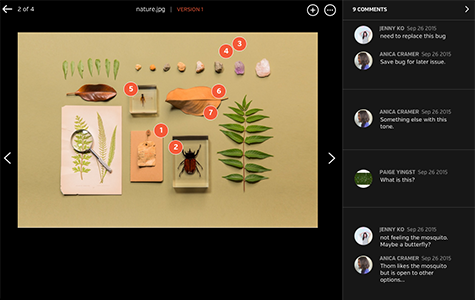 Teams: Send large files, collaborate in real-time and manage creative projects with your team. The Hightail Teams plan allows you to purchase multiple users online (from 1-15 users per organization) and allows users to send file sizes up to 50GB with unlimited storage. The Teams plan also includes features such as file previews, organization, annotations, version control, discussions, follow-ups, approval routing and more. Business: Create unlimited visual project folders (called a Space) with collaboration and project management features such as approval routing and assigning to-dos, upload unlimited files up to 100GB each, protect them with access codes and manage user permissions., plus intuitive admin controls , detailed activity analysis for your entire company, advanced organization options and priority support.